Kia Ora is the Maori greeting that welcomes visitors to this land of fiery volcanoes and glacial ice. Steam billows from craters that delve deep into the earth and snow crowns magnificent mountains that soar to the sky. Mud pools boil and glacial lakes glisten. Unique and flightless birds like the kiwi and now-extinct moa, largest bird on earth, flourished until the arrival of man and other predators. A thousand years ago, guided by the wind and the stars, Polynesian Maoris migrated in canoes, making this the earth’s last land mass to be discovered. They named it Aotearoa, Land of the Long White Cloud, for the white-topped mountains. Europeans began to settle here After Captain Cook’s circumnavigation of the area. New Zealand became a British colony and bicultural nation. Then the Gold Rush brought fortune seekers from around the world. New Zealand is in the Pacific “Ring of Fire”, where the colossal forces of the Pacific and Australian tectonic plates meet, creating mountain ridges and geologic wonders. This extraordinary range of scenery is largely uninterrupted by human habitation. Over 40 million sheep graze on verdant hillsides, yet there are just over 4 million human residents, mostly in Auckland and other urban areas. Little wonder this country about the size of Colorado tops the list as a dream vacation destination. Coach travel allowed us to sit back and enjoy the panoramic view. We wanted to explore New Zealand in as carefree a way as possible. We did this by combining coaches, ferries, trains and planes, arriving in each destination relaxed and ready to explore on our own. We marveled at the scenery through panoramic windows in dramatic, winding, mountainous areas without concern about driving on the opposite side of the road. We explored by land and sea. The grand finale—a flight from Queenstown back to Auckland, featured spectacular views of the Southern Alps and glaciers. We usually travel independently, and weren’t sure that coach travel was for us. Then we met a lovely Kiwi (as New Zealanders are called) couple, the Lairds, while traveling in France. They highly recommended Newman’s Coach’s Great Sights Tours and Tranz Scenic Trains. We could book each point-to-point trip individually, or buy either a regional InterCity CoachPass or a Travelpass for a given number of days of travel. Individual tickets and seven day passes are offered for Tranz Scenic trains. We could easily arrange our trip according to our schedule and interests and then simply sit back and enjoy the view. 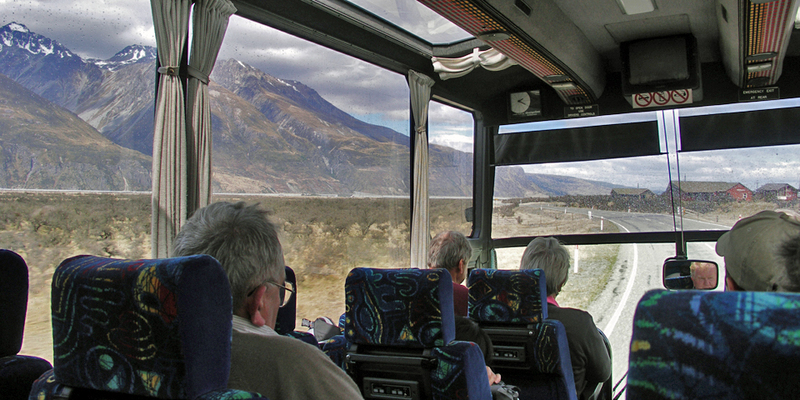 Newman’s Coachlines connects between the major cities and sights throughout New Zealand and stop at points of interest along the way. It also picks up and drops off passengers and luggage at many centrally located hotels and offer city tours. InterCity coaches stop at places in between. Prearranged coach itineraries based on the number of days you have to travel are available. Here is how we customized our trip, traveling by road, rail, sea and air, with plenty of time to explore on our own. Auckland, New Zealand’s largest city, is easily identified by the 1076´ high Sky Tower, tallest in Southern hemisphere. Newman’s offers a half day tour, an easy orientation after the 13 hour flight from California. A visit to the Auckland War Memorial Museum, built on a dormant volcano, is a great introduction to New Zealand history to an opportunity see some of most significant Maori treasures anywhere. Stroll along the delightful Viaduct Harbor area of the City of Sails, home to the America’s Cup. Enjoy fine waterfront restaurants, hire a boat, catch a ferry to one of the islands, or visit the National Maritime Museum. 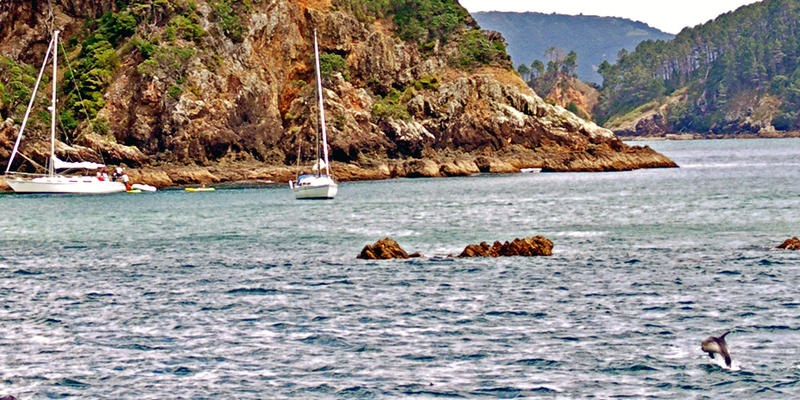 Sail the scenic Bay of Islands and spot marine creatures like playful dolphins. To experience a North Island seaside resort, try Newman’s day or overnight trip to the Bay of Islands. This birthplace of New Zealand is where the Maori canoes first landed. Visit the park-like Waitangi Treaty Grounds and Te Whare Runanga Maori Meeting House. Then cruise on the King’s Dolphin Seeker past picturesque little islands and through the famous Hole in the Rock. Watch for dolphins, fur seals, rare penguins, and, if the season is right, Orca whales. 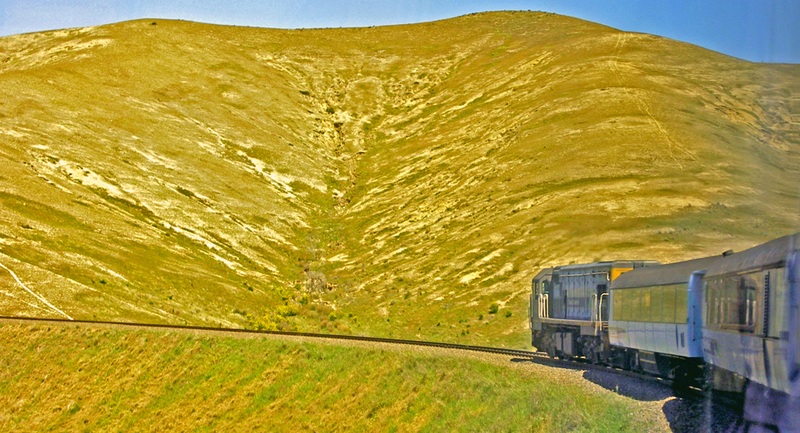 The Overlander scenic train runs between Auckland and Wellington past ski towns, farmland, the volcanic plateau, mountains, river gorges and the famous Raurimu Spiral. Once in the world’s southernmost capital, Wellington, don’t miss the renowned interactive national museum, Te Papa. It’s a cultural hub with lively restaurants in the city center. If you have time, tour Parliament. The ferry ride between the North and South Islands of New Zealand is said to be one of the most scenic in the world. 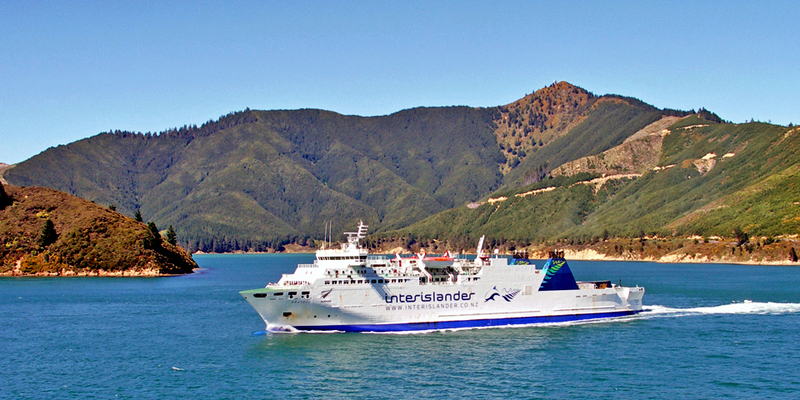 Then board the Interislander to the South Island for one of the most scenic ferry rides in the world. Take a coach to the west coast or the Tranz Coastal train past farmland and the Marlborough wine region of the Pacific coastline to Christchurch, largest city in the South Island. The train crosses 175 bridges and passes through 22 tunnels and some of New Zealand’s finest scenery. You may want to stop in Kaikoura for a whale watch or a swim with the dolphins. Christchurch, largest city in the South Island, is known for festivals and the lovely botanical gardens adjacent to the Canterbury Museum. Wednesdays through Fridays, there’s a lively outdoor crafts market in Cathedral Square, a fun place to shop for wool hand knits, sheepskin, or carved jewelry in bone or Maori pounamu (jade or greenstone). Take the tram through the historic district, stopping at the Art Centre and crafts market, museums and galleries. Ride a gondola to the top of an extinct volcano. Go punting on the Avon. Daytrip to Akaroa to cruise or swim with the dolphins. 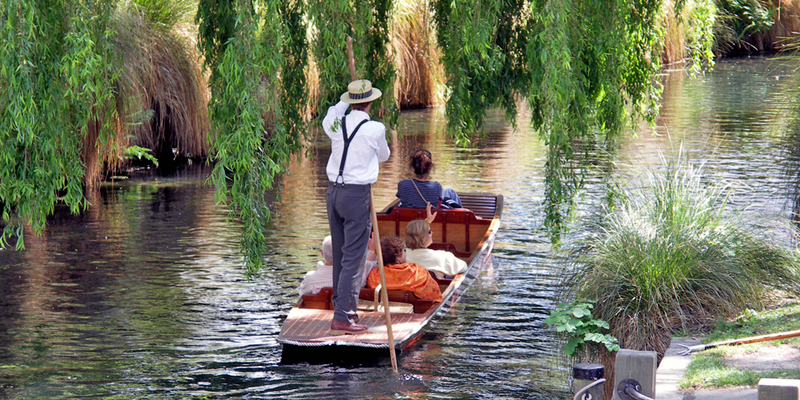 Christchurch reflects the influences of the early English settlers with activities like punting on the Avon. Christchurch is the aerial gateway to the Antarctic, and visitors can enjoy interactive exhibits—or take a thrilling ride on the Antarctic vehicle known as the Hagglund—at the International Antarctic Center. Not to be missed is the Tranz Alpine Scenic Rail between Christchurch and Greymouth, named one of the world’s great scenic railway journeys. The four and a half hour ride spans from one coast to the other, past the alluvial plains and farmland, stunning gorges, and river valleys, ascending the Southern Alps and descending to the lush beech rain forest to Greymouth. Photographers flock to the open-air carriage. Continue on to the glacial regions of the west coast or return the same day to Christchurch. We opted to enjoy this magnificent scenery — fertile plains, arid basins, azure lakes and mountain passes — by road, as well. We experienced the alpine wilderness of Mount Cook National Park—and the 3,764m 12,349’ Mount Cook—Aorangi, the “cloud in the sky”— with Newman’s Mount Cook Day Tour. This all-day excursion took us from Christchurch to the resort of Queenstown, Adventure Capital of the World. Queenstown is known for the recreational opportunities afforded by the mountains that run true north-south, the Remarkables, and New Zealand’s third largest lake, Wakatipu. It’s no surprise that a land as spectacular as this is also known for the wild and wooly outdoor adrenaline rush. New Zealand is the birthplace of extreme adventures. Adventure tourists can soar skyward in a slingshot bungee, leap from the bridge where bungee began, or experience 360° spins where jet boating was launched. Paraglide from a cliff, zip wire over a gorge, body-board head first down the rapids, heli-ski on pristine snow, or embark on a wilderness trek. The downtown area is compact and walkable, with a full range of dining and shopping opportunities. Perhaps you would prefer to relax amidst the vines. There are over 80 wineries in this Central Otago region, many open to public. Spend an afternoon sipping renowned pinot noir or some of the wonderful Chardonnays, Sauvignons, Rieslings, and Pinot Gris. 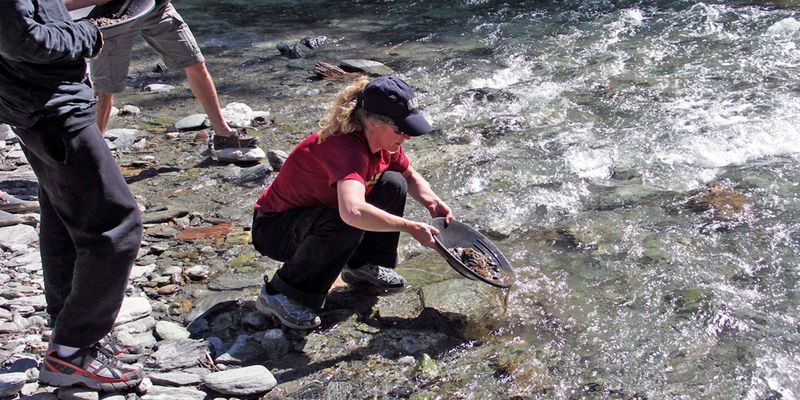 The Shotover River was one of the richest in gold panning history. When gold was discovered here by sheep shearers in the 1860s, Queenstown quickly became a wild frontier town. The Shotover River was one of the richest in gold panning history, second only to the Klondike River in Northwest Canada. A 4WD adventure with Nomad Safari takes you along breathtaking and dramatic rock cliffs with sheer drops. Skipper’s Canyon Road was cut by hand into steep cliffs by early prospectors in their quest for gold. Skipper’s Canyon Road was cut by hand by early prospectors in their quest for gold. 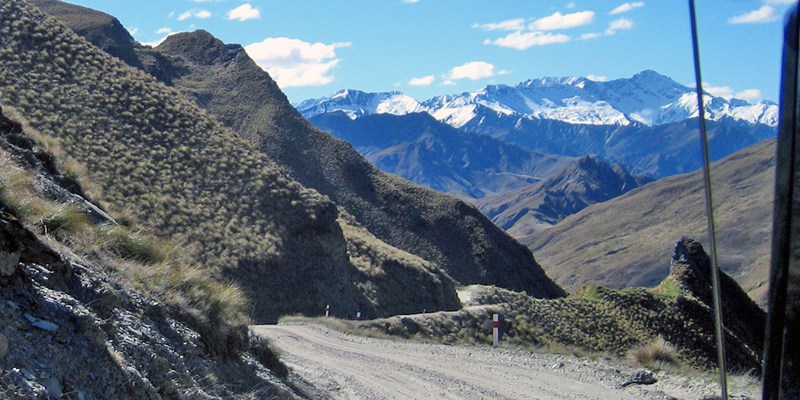 One of top scenic trips in the world, it offers spectacular views of the Queenstown area. Cross the river of the Arrow Gorge. Pan for gold. See the Kawarau Gorge Bridge, site of the original bungee jump in 1988. Walk in the footsteps of Hobbits at Lord of the Rings film sites. From Queenstown, Newman’s offers a trip along New Zealand’s most spectacular highways with overnight tours to the West Coast Lakes and Glaciers. Real Journeys runs the Milford Sound Tour Experience past farmlands and sheep-dotted slopes to Fiordland National Park. 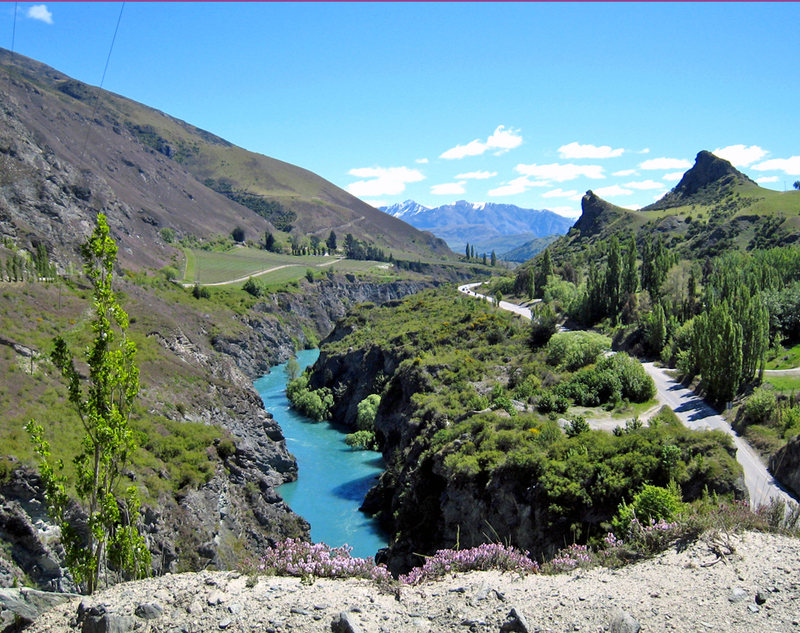 Travel by coach through “The Divide”, the southern-most pass of the Southern Alps, and the nearly 4,000’ Homer Tunnel. New Zealand’s most visited natural attraction, Milford Sound is a scenic wonder of the world known for the majestic mile-high Mitre Peak. Sail in a catamaran and spot slumbering fur seals, rare penguins, and playful dolphin. For an added thrill, fly over the fiords back to Queenstown. 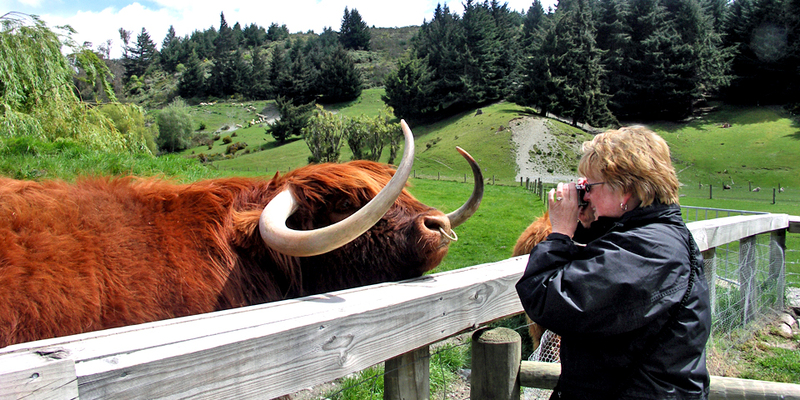 Among the animals you’ll meet at Walter Peak Farm are Scottish Highland cattle. Real Journeys also owns Queenstown’s vintage steamship, the TSS Earnslaw. Cruises on Lake Wakatipu to Walter Peak High Country Farm offer a taste of New Zealand’s rural life, including a farm tour and sheep shearing, topped off by a barbecue lunch, afternoon tea, or evening dining. 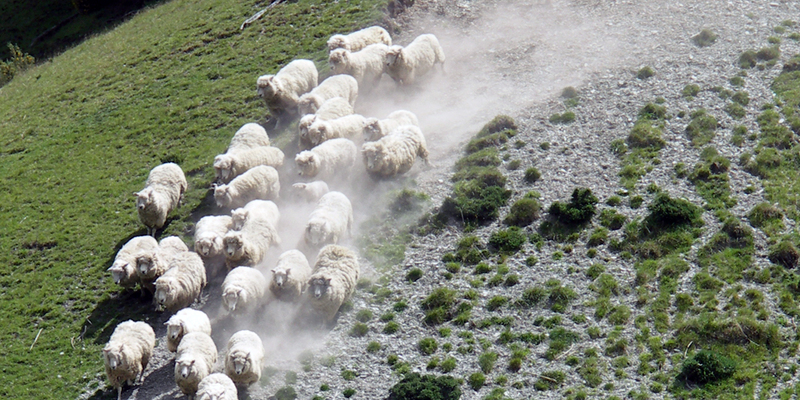 New Zealand’s sheep dogs are well trained managers of a sheep station’s flocks. And speaking of food, New Zealand specialties include, of course, lamb and seafood– green lipped mussels, crayfish, and oysters, and tiny whitebait. Add some kumara (sweet potato) and other local produce and wine. Top it off with a Lemon and Paeroa soft drink, and some hokey pokey ice cream or the meringue dessert known as pavlova. Manuka honey, with its therapeutic benefits, is great on toast. And don’t forget kiwifruit, named for the bird that became a national symbol. For a fine New Zealand product, stop by one of the shops that features soft and warm knitwear of possum fur blended with merino wool. New Zealand’s 70 million possums devour 22,000 tons of forest nightly, and the purchase of these products is considered support for conservation. However you decide to travel, you will find yourself in a friendly, easy-going environment, with plenty of room to roam. New Zealand is also one of the remaining places where good value can still be had for the American dollar. 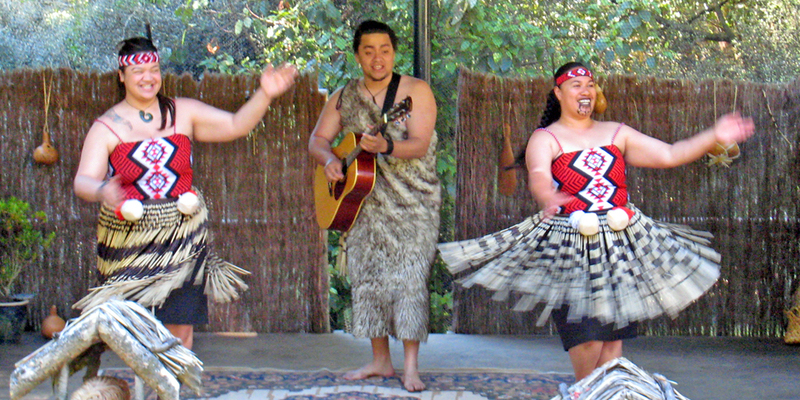 Enjoy a Maori Cultural Show like this one at the Kiwi Birdlife Park. Whether you prefer a Maori cultural show and hangi dinner or a formal British afternoon tea, the excitement of the city or the serenity of the wilderness, a hot mineral pool or a glacial trek, a cutting-edge adventure or simply sit a fabulous view, it’s here for you to enjoy in 100% Pure New Zealand. InterCity is part of the CarboNZero program to reduce emissions at their source. By utilizing coach transport, we created a carbon footprint up to 90% lower than by driving a motor vehicle.